The Beauty Scoop: Fix Your Dry, Cracked Hands! I'm not sure if it's just because it's been a colder winter around here this year or if I am simply not hydrated enough, but my skin has been incredibly dry this season. My husband, daughter, and myself are struggling with our hands being so dry that they are even cracking open and bleeding. On our search to find relief, I thought I would share a few products that have become our saving grace! We have blogged about this product several times in the past, but when something works this well you just have to keep mentioning it! 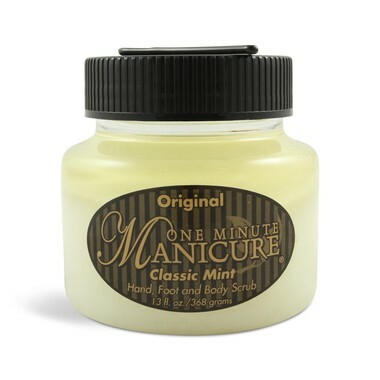 One Minute Manicure has worked wonders on my dry skin. My poor hands started looking literally ten years older due to being so dry! I stumbled across this in my bathroom cabinet and immediately used it. My hands feel and smell amazing. I will definitely be passing this along to my husband as soon as he gets home. **Note - it did sting me a little due to my hands being cracked open, so I haven't yet tried it on my daughter** It does have a gritty feel to it, so just be cautious if your hands are already seriously dry. Billy Jealousy Golden Gloves is another fantastic option. While doing research for the recent 12 Brands of Christmas promo I stumbled across the above article stating how amazing this product is for the harsh Winter months and for men who work with their hands on a regular basis. I immediately grabbed one off the shelf for my husband to try. It did take a few days, but the results were definitely impressive and it's now a staple on his night stand. DRINK EXTRA WATER! Keeping yourself hydrated is key! AVOID HOT BATHS AND SHOWERS! When water is too hot it actually pulls the moisture from your skin which will worsen your dry skin. EXFOLIATE then MOISTURIZE! Removing that flaky skin so you can moisturize the healthier skin underneath will make a BIG difference. Just make sure you don't over exfoliate.